Finally, a playground that will fit your Scandinavian Instagram feed. IKEA, step aside. A brand new children’s playground in Alexandria, Sydney is unlike any children’s playspace you’ve seen before. Built around best practices for early-childhood education, Nubo has thrown out the clichés of bright colours and light-up plastic toys in favour of smooth contours, uncomplicated spaces and a neutral colour palette. The roomy 760 square metre space boasts a library with private pods and a ‘giant air balloon’ for children to lose themselves in a good book, a big room full of blue building blocks and pipes, LEGO WeDo 2.0 and Kaleido gears. Nubo’s passion is to create a space of ‘pure play’, with neutral, open-ended spaces that allow children to immerse themselves in imaginative and creative play. They also provide cooking, art and robotics workshops. 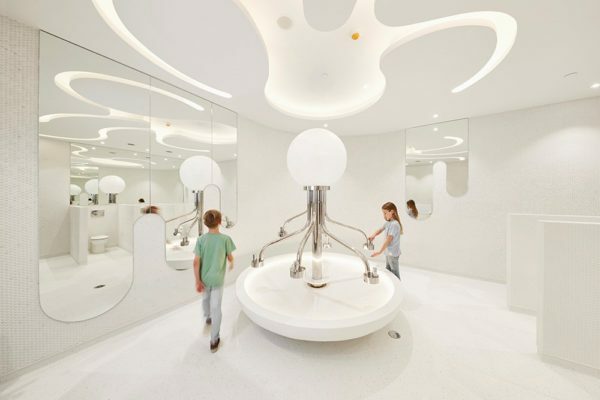 And the kids’ bathroom looks like something out of a science fiction film! To celebrate their opening, Nubo are offering ‘buy one, get one free’ passes and free workshops throughout December. At almost $20 an hour per child, the Nubo experience doesn’t come cheap, but it promises to be unlike any playground or library your children have ever visited before.